Luxury Dumbbells by Hock "Goldloft"
The healthy lifestyle is a trend and that is a fact and it is almost impossible to surprise anyone with a sports bike for 20,000 euros, but fortunately, there are constantly new products in our shop that is able to amaze even the most discerning connoisseurs of design and luxury. Today we present you the most expensive dumbbells in the world by Hock - the limited edition "Goldloft" for the price of €99,000. The brand Hock produces the premium segment sports inventory. The company was founded in Germany by Christoph Hock in 2009 and has already won the coveted "ISPO Brandnew Award" and was also nominated for the prestigious "Designpreis Deutschland". Worldwide, this brand is still very little known_ which makes them even more interesting for the trendsetter. Hock masters represent the fresh vision of sports equipment: "style in motion". Dumbbells Hock represent the opposite of dull sports equipment that can add a touch of luxury to any workout. Even the name of the limited dumbbell models "Goldloft" indicates in which furnishing style the dumbbells would look better - these dumbbells are a perfect complement to modern style "loft". After training, these weights can not be taken away anywhere, as they would only highlight your own style. By the way, style is not the only thing why the most expensive dumbbells in the world are so much beloved. In production, Hock uses the most innovative know-how and materials. 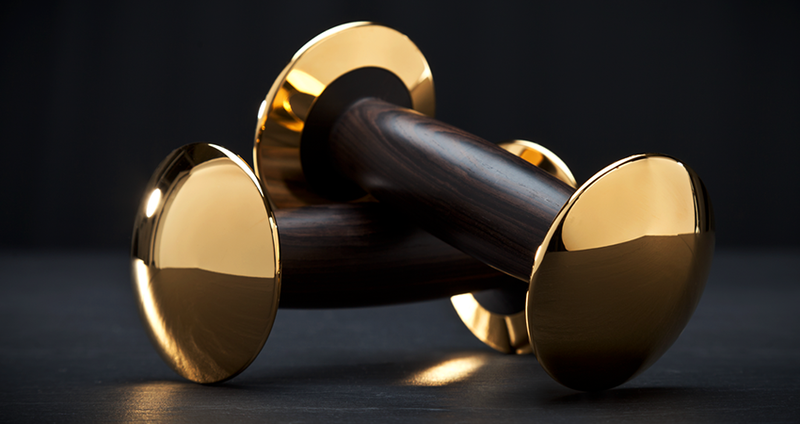 The dumbbell handle of the "Goldloft" series consists of the most valuable African grenadilla wood. Many people confuse it with ebony, but this tree is even more elegant, more durable and more valuable. The handle is made with a harmonic thickening towards the center, which makes the dumbbells more comfortable in use. Thanks to this design, the dumbbells are pressed organically close to the hand and do not slide. The dumbbells are made of 18-carat gold. Taking this into account, you can literally become an owner of the gold muscle. So, if you can afford it, you'll be one of the few owners of exclusive "Goldloft" dumbbells. By the way, exactly this model of the Hock dumbbells came in the famous gift guide by Gwyneth Paltrow. 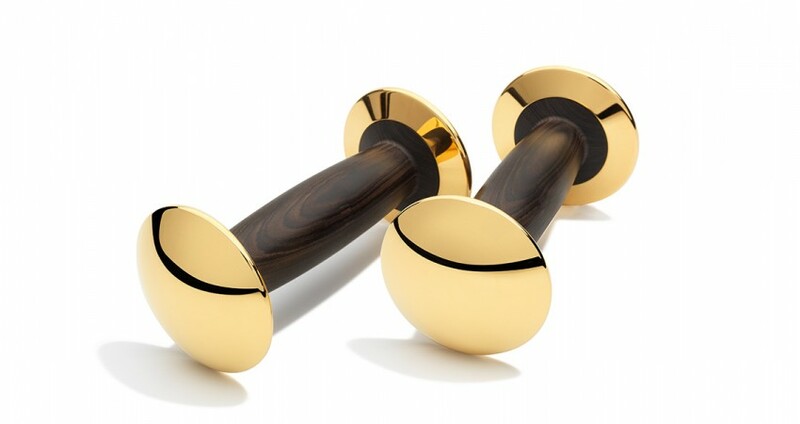 Goldloft Dumbbells by Hock - the way to gild the legendary phrase "Just do it". Goldloft Hanteln von Hock - der Weg, um den legendären Satz "Just do it" zu vergolden. Press "Send my order ". After your order is confirmed by a specialist you will receive the Order Conditions Letter (OCL) from: Orders@lux-exchange.com. OCL contains information about the final price, delivery terms, and payment requisites. If you would like to make a Special order just send us an e-mail in free form to: Orders@lux-exchange.com, and we will contact you. Price of the Hocking Dumbbells of the limited edition "Goldloft" is €99,000. Please note that the final price of the Hock dumbbells may differ from the price stated on the website (especially in the case of individual orders with individual engraving). For this reason, the order is processed first and only then, when the final price is matched, the order can be paid. We deliver the dumbbells of the limited edition Goldloft to every country in the world. To Germany and within Europe, if the necessary model of dumbbells is available in the warehouse, the delivery can take up to 2 weeks. The dumbbells are sent directly from the warehouse of the manufacturer Hock (Germany) to the customer. Delivery time begins with the confirmation of the order by 100% advance payment.